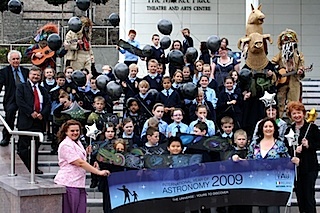 On Friday 18 September boys and girls from Mount St. Catherine’s Primary School, Armagh, have surprised the participants of the International Symposium “Light Pollution and its Impact” at the Market Place Theatre with a live performance of music, poetry, art and dance. 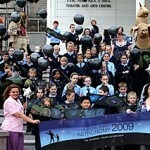 The children’s contribution, “The Dragon’s Egg”, involved an innovative collaboration between members of the Armagh Rhymers (Dara Vallely, Peter Shortall, Steve Lally, John McAllister), staff from Mount St. Catherine’s Primary School (Anne Hart, Brenda Campbell and Briege Delaney) and astronomer Miruna Popescu, coordinator of the International Year of Astronomy in Ireland. The students wrote poems about stars and light pollution on the back of the “Conjunction over Armagh” postcard that were handed to the symposium participants as a welcoming to Armagh. But the biggest “surprise” was a musical and dancing performance during Friday’s lunch break. The children also displayed their paintings inspired by the night sky, created during the UNAWE Astro-Art Fun workshop and released black balloons decorated with constellations. Support from the Republic of Ireland’s “Discover Science and Engineering” (DSE) programme for running the Astro-Art Fun workshop is gratefully acknowledged.